The Vietnam War was the first conflict where helicopters played an important role. While the future Cold War battlefield in Europe would have consisted of great tank battles, the jungles of Vietnam prevented tanks from moving efficiently. There were American tanks in the Vietnam War, but their main purpose was to keep roads clear from the enemy by using a tactic called Thunder Run, which is the same tactic that years later would be used by American tanks to capture Baghdad. Tanks in the Vietnam War were always staying close to roads because a tank in a jungle is a big target for the enemy. But the tanks would clear jungle close to roads if needed. There's an example of a helicopter that crashed in the jungle. To rescue it, tanks on a nearby road were ordered to move through the jungle and secure the crash site. And if the enemy had built a bunker, a tank would drive up to the bunker, stick the barrel into the bunker, and fire. But again, these bunkers had to be close to roads or the tank would simply not be able to get there. The helicopter transported infantry was sent to Vietnam. But if you've seen the movie We Were Soldiers, you know that helicopter transported infantry wasn't a three-dimensional nightmare for an enemy commander. 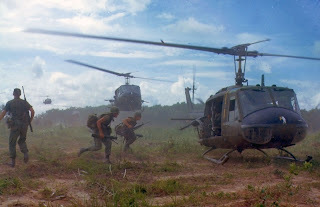 If the enemy could cut off the few landing zones available in the Vietnamese jungle, where the helicopters could land, the infantry would be on its own. Each Huey has two machine guns operated by relatively unprotected soldiers, so the damage they could make was limited. The solders on the ground could get support in the form of artillery and air support from winged aircraft, but this support wasn't accurate enough to rescue the infantry in all situations. So something else was needed. The Huey was a great helicopter, so someone realized that it was possible to take the basic engine and rotor, but add a new body to get a helicopter that could support the infantry. 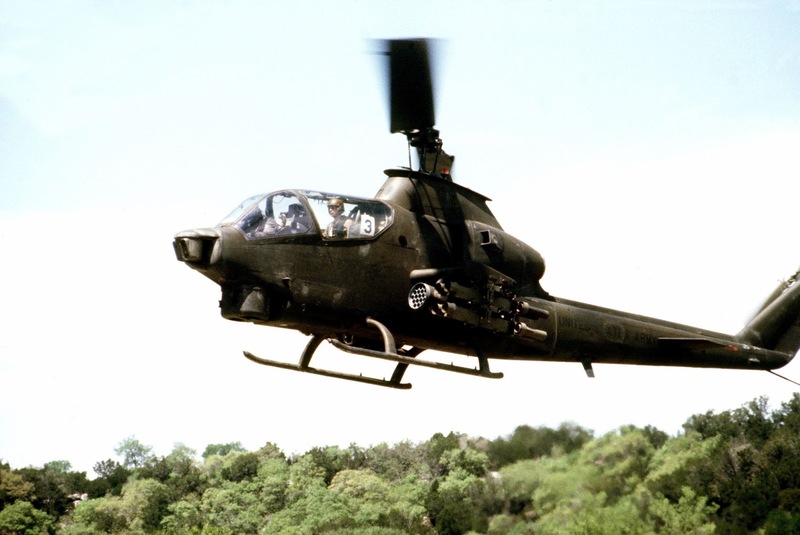 So the Bell AH-1 Cobra was quickly developed and would arrive to the Vietnam War. The Cobra could kill the enemy but it couldn't find it. So someone came up with idea idea that you could combine the Cobra with the smaller, but much more agile helicopter Hughes OH-6 Cayuse (nicknamed Loach). Now you would get a so-called hunter-killer team, where the Loach was finding the enemy and the Cobra was killing it. The Loach could seat five: two pilots and three passengers. But in the Vietnam War, the Loach had either two pilots and one gunner, or one pilot, one gunner, and one mini-gun fired by the pilot. Why not four in the helicopter and a mini-gun? Because that would make it too heavy! Find enemy base camps, fighting positions, supply caches, trails, and other signs of enemy movements. Assess damage made by high-altitude bombers, such as the B-52. Find landing zones for the infantry carried by the Huey helicopters. Help the infantry and tanks on the ground by giving them information, such as which terrain is the most advantageous, and if the are moving in the correct direction. If you are a scout pilot (the hunter), the easiest way to find out where the enemy is hiding is to fly as close as possible to where you think the enemy is and hope that the enemy will fire at you. If you are fired at, then you drop smoke, so the Cobra (the killer) know where the enemy is and can fire the rockets. The result of this suicide tactic was that Mills was shot down no less than sixteen times and wounded three times. Though I was getting shot at almost every day, I never got used to it. But getting shot at was usually the way a scout found the enemy, and finding the enemy was our basic job. It might sound strange to sacrifice one helicopter, while the other helicopter is waiting for the scout the be shot at. But the pilot in a Loach has a better view of the surroundings, and the Loach is also a smaller helicopter making it more difficult to hit, so the tactic makes sense. To help the Loach, the Cobra was always staying within sight of it and did everything the pilot in the Loach didn't have time to do. The Loach pilot had to fly the helicopter while having his eyes constantly focused on the ground, so the Cobra read the map and transmitted radio messages. The good scout pilot never stops talking to his gun [the Cobra] from the moment he goes down out of altitude until he comes back up again. It not only keeps the Cobra happy and informed, but it tends to keep your own guts stabilized when you're down low working and, at any instant, could catch a bellyful of AK-47 fire.